A personal blog to share with you my life experiences, challenges, travel, family, parenting, food, housekeeping tips, interests, work, business and anything that could be of essence to one’s daily living. Cleaning is never a fun job, but someone has to do it. When your home needs a quick clean, you might think that dusting the floor and wiping the surfaces is enough. It's not. If you spend just a few more minutes on your cleaning routine, you can completely revitalize your household. Your home should be your pride and joy. If you take good care of your home, the results will be rewarding. People tend to think that cleaning has to be a huge hassle. By doing just a little every day, you can stay on top of your cleaning without it impacting your lifestyle. You use sponges every day when you wash your plates and surfaces. It may shock you to find that your sponges are home to all kinds of bacteria. When you use your sponges for a long period, they become filthy. Wiping a dirty sponge across your kitchen surface, means that you are wiping germs and bacteria onto it. When you are cooking, you might put your ingredients on that surface. The best thing you can do, aside from using an anti-bacterial soap, is throw your sponges away after a day or so. It might seem wasteful, but it is better than spreading germs. Grouting is the strip of sealant between your bathroom tiles. Believe it or not, this strip should be bright white. If your grouting has turned a dark shade of grey, it means that it is dirty. You can clean your grouting with ease if you set aside just ten or fifteen minutes. Make sure that you wear rubber gloves while you are cleaning. Use a toothbrush and some bleach to scrub the area. You will have to get down on your knees to scrub your grouting. If you suffer from a condition like an osteoarthritis knee, you might want to put a cushion under your knees so that it doesn't hurt. Another place where you will find loads of bacteria is in your carpet. 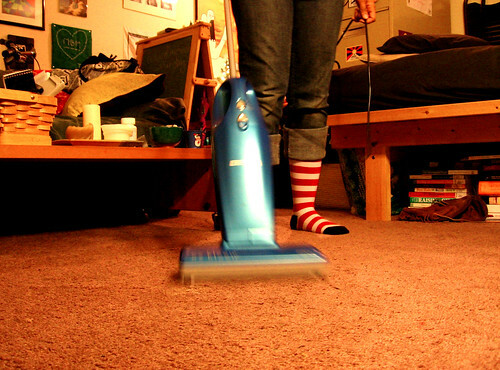 Deep cleansing your carpet is a habit you should get into sooner rather than later. Every four months, you should give your carpet a clean. That doesn't mean just vacuuming. You should hire a steam machine from your local DIY store and get a quality cleaning solution. Smother your carpet area in the solution and leave for about three hours. Next, use the steam machine to cleanse the area. You might need to clean your carpet in sections to make the job is easy for you. Now and then, you get a nasty stain that you just can't shift. Let's talk about red wine for a second. When you get red wine on your floor, it can be an absolute nightmare. You need to act fast as soon as you spill the wine on the floor. Use hot water to clean the area with a sponge. Blot the area, rather than scrubbing it. You might think that scrubbing will get the stain out, but it will spread the stain across your carpet. Use some white vinegar and soap to make a cleaning solution to get the stain out fast. Dust gathers everywhere in your home. When you have dust on your radiators, they won't work well. During the winter, you want your heaters to work and keep your house warm. If anyone in your home has allergies, you need to make sure that you dust the area. Take an old rag and make it damp. When the radiators are off, use the rag to wipe them down. Blogger Since 2009. Content Writer. Social Media Marketer. Entrepreneur. Bookworm. Baker. Homebody. BS Tourism Graduate at UST, 1988. Continuous Learner. Wife of a DVM. Mother of two boys, an IT and a future Computer Programmer. For blog sponsorship, advertising, press release and product reviews please don't hesitate to send me an email – joybianca.blanca@gmail.com today! Climb Kilimanjaro: Tips for Success!